Feeding a crowd? Keep it easy – and flavorful – with our Slow Cooker Chicken Tortilla Soup recipe. Don’t stress about the food the next time you have guests for dinner. This savory Slow Cooker Chicken Tortilla Soup recipe almost makes itself and is loaded with ingredients that you probably already have in your pantry. Any recipe that is loaded with Mexican flavors – think chili powder, cumin, oregano and crushed red pepper – is always a crowd-pleaser around here. This Slow Cooker Chicken Tortilla Soup earns double points because it has killer flavor AND is super simple to make. Literally. Throw the laundry list of ingredients in the slow cooker and let the machine work its magic. Your reward is a hearty soup that feeds an army with hardly any work on your part. I love to serve this soup buffet-style with an array of toppings to suit every tasty bud. Lots of fresh cilantro, sour cream, creamy avocado and salty tortilla strips are a must, but shredded cheese, chopped tomatoes and jalapeno slices are tasty add-ins, too. Feel free to dial the heat up or down in this Slow Cooker Chicken Tortilla Soup by adding more or less jalapeno peppers and crushed red pepper, but take my advice and don’t skip the fresh lime juice. It instantly brightens the flavor of the soup and adds an irresistibly tasty tang to every bite. Tip: Hosting a large group? Double the recipe and use two slow cookers. 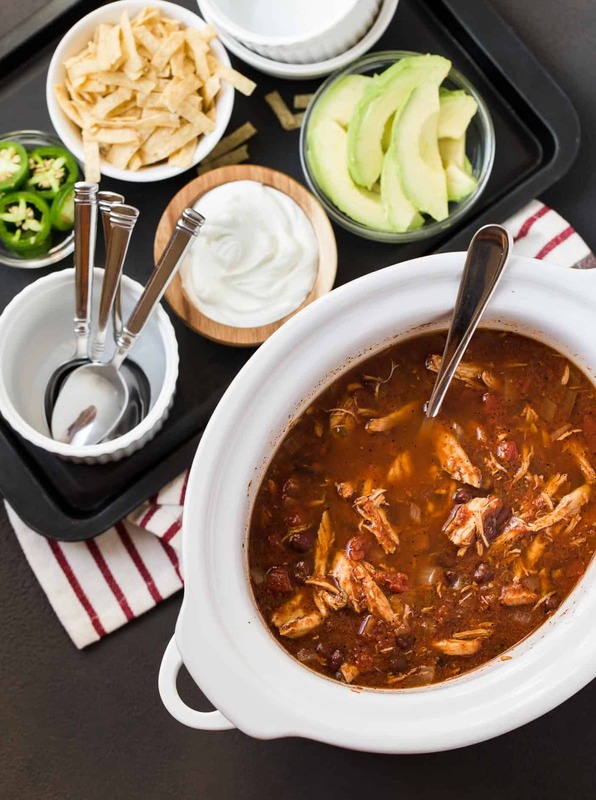 Or do one batch of this Slow Cooker Chicken Tortilla Soup and add some variety with our Slow Cooker White Chicken Chili. Feeding just a few? Halve the recipe or freeze the leftovers. This recipe reheats beautifully, giving you two meals for the price of one! Place onion and next 11 ingredients (through crushed red pepper) in a large slow cooker. Gently stir to mix. Nestle chicken breasts in soup mixture and cover. Cook on low heat for 8 hours. Remove chicken breasts from slow cooker and shred with two forks. Return chicken to slow cooker. Stir in lime juice and add salt and pepper to taste. Serve with tortilla chips, cilantro, sour cream, shredded cheese and avocado, if desired. I love slow cooker soups!!! This has my name all over it. So great seeing you both! You, too, Liz! Such a great event! Nothing better than having dinner ready to go the moment you walk in the door! I love using the slow cooker this time of year! It would be fantastic to have a pot of this ready at the end of the day! I agree, Faith. Love simplifying life any way possible! I don’t know what’s more amazing, your delicious looking slow cooker tortilla soup (one of my favorites!) or that pho broth in a French press video (are you kidding?)! Both are great ideas using my favorite spices from McCormick! Thanks, Janelle. Lovely to meet you in person last week! I love McCormick…the BEST! This recipe looks totally amazing. Thanks for sharing! I lose count of the number of McCormick products in my pantry right now, Becky! We love soup in our house. Especially a hearty flavorful one like this. YUMMY! This looks like comfort in a bowl – delicious and so fun! Easy AND tasty…right up my alley, Jeanette! Chicken Tortilla Soup is my favorite, I can’t wait to try this. I am totally loving how easy this is to make in the slow cooker! Gotta love slow cooker season! Looks so good.going to try it this week. I hope you enjoy it! Stop back and leave us your thoughts if you have time. This tortilla soup looks SO delicious and jam packed full of yummy flavour! 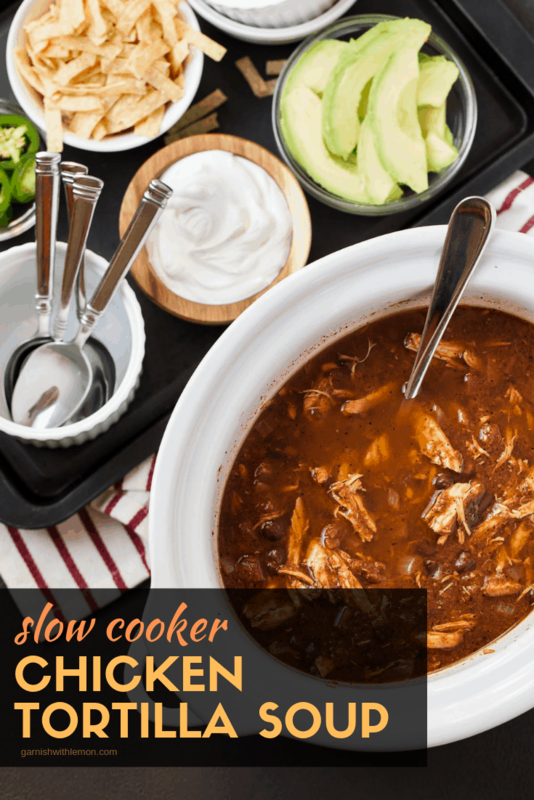 I love that you can use a slow cooker especially – this recipe is definitely the perfect excuse for me to get out and use my slow cooker. Thanks for sharing it! Slow cooker soup is the bomb because soup rocks when it is just sitting in all the deliciousness and cooking for hours! 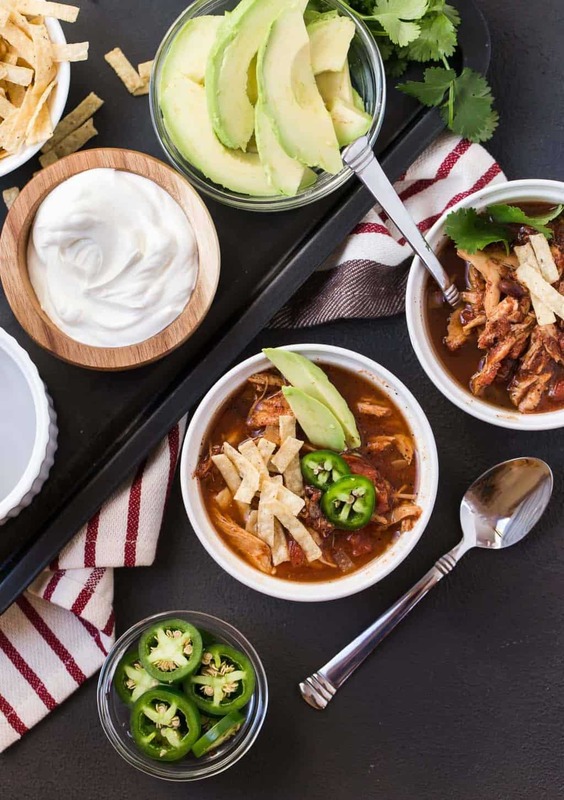 LOVE anything Mexican girls, this Tortilla soup is right up my alley… and totally checking out that Pho! YUM! Thanks, Krista! Great seeing you again! Hope he enjoys it as much as we do, Jenn! I love this soup! Mexican is my favorite food group, and this looks great for a cold day. I love that you used the slow cooker as well! Mmmmm I could live off of of chicken tortilla soup but in the slow cooker makes it even better! Loved meeting both of you last weekend. And hope to see you all again soon!! It was wonderful to meet you, too!! Yum! I LOVE slow cooker recipes! So easy! Me, too, Sara! Thanks for stopping by! This is my kind of comfort food! Totally loved meeting y’all!! Loved meeting you and your momma, too! You guys could definitely be sisters! Slow cooker meals are the best, especially when they are hearty and flavorful like this soup! Nothing beats a good slow cooker meal! My family would go crazy for this dinner! Hope they enjoy it, Lori! This soup would be a hit in my house!